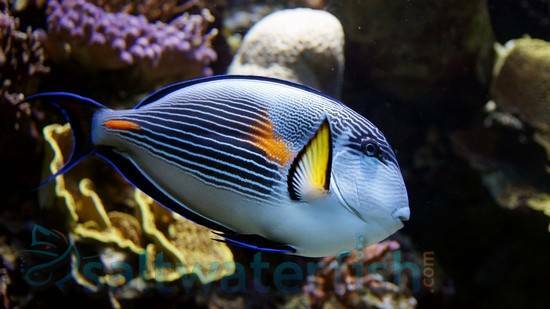 The Sohal Tang, Acanthurus sohal, is commonly referred to as the Sohal Surgeonfish and Red Sea Clown Surgeon, and less commonly the Zebra Surgeon, Majestic Tang, Majestic Surgeon, Zebra Tang, and Arabian Tang. Featuring a stunning light blue body with orange streaks, bright yellow pectoral fins, and dark blue horizontal lines, the Sohal Tang will be an instant influx of color and vibrancy to your tank. The Sohal Tang can be a difficult fish to care for so it should be reserved for the experienced aquarist only. Sometimes aggressive towards other species of Tangs or Wrasses, it is best to keep the Sohal in a large reef tank to curb aggression. They will eat a varied omnivorous diet including meaty foods as well as seaweeds and alga. These herbivorous preparations can decrease aggression, increase their immune systems and improve overall health. The Sohal Tang is sometimes prone to a marine disease called Lateral Line erosion so frequent health checks are suggested. 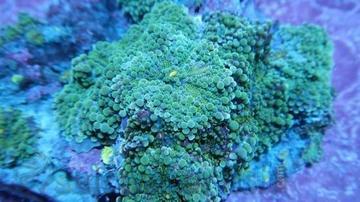 As the Sohal is safe with inverts and corals it can be safely kept in most reef tanks. Ricordea sp. w/ Scleractinia sp.